Wallaby 3 Phototherapy System allows a mother to hold and even nurse her baby without interrupting therapy. At 3.26 Kg, the Wallaby 3 is light enough to be easily transported with the baby. There is no infrared or ultraviolet light to harm the baby. 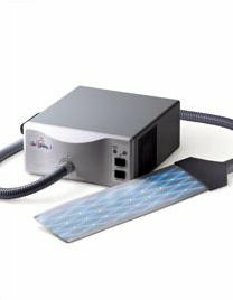 Every aspect of this device has been designed to make it the most complete and most portable phototherapy system available. Units are in excellent cosmetic condition, are disinfected, patient-ready and operate to the manufacturers specifications. Includes 7.62 cm x 35.56 cm wrap-around panel.